January 25, 2010 – Today Ubisoft revealed that Assassin’s Creed 2 will be coming to the PC on March 16. Priced at $59.99, ten dollars more than a normal PC game, Assassin’s Creed 2 for the PC will include both the “Battle of Forli” and “Bonfire of the Vanities” DLC. Ubisoft also revealed that there will be a “Black Edition” of the game, available for $64.99. No extra details were revealed about what the “Black Edition” will contain. Assassin’s Creed 2 follows the story of Ezio Auditore da Firenza, who vows revenge after his family members are killed by corrupt officials with a conspiracy to hide. 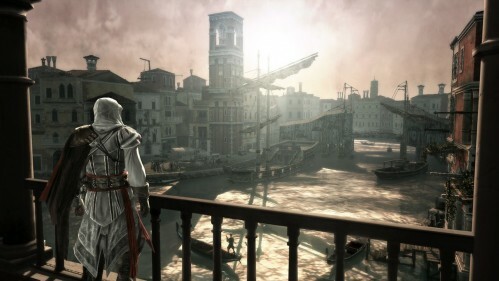 Taking place in 15th century Italy, the game takes Ezio to beautifully rendered models of Florence, Venice, Forli and the Tuscan countryside. In addition to the main storyline, which sees Ezio tracking down those responsible for his family’s deaths, there are also hundreds of side missions involving assassinations, improving your manor & the town surrounding it and searching for treasure. Assassin’s Creed 2 was developed by Ubisoft Montreal and published by Ubisoft. It is available for the PS3 and Xbox 360. Supported Video Cards: ATI Radeon X1950, HD 2000/3000/4000/5000 series NVIDIA GeForce 7/8/9/100/200 series.